Calling all Pirates, plunderers and pillagers! There be booty at this camp! Camp Anaconda sponsors the (probably) first ever CCC camp Scavenger hunt. Get to know the grounds, the people, and your fellow campers while competing for (probably) fabulous prizes! The Quest will commence on Day 1 of the camp. Come pick up the list at the Camp Anaconda Headquarters, or look back here once the contest begins. The game ends 19:30, Day 4 (Saturday) at Camp Anaconda, where we will judge your booty, tally points, and distribute prizes! There will be paper printouts of the list at Camp Anaconda at some point today, as well as pdf's on a pen drive for you to put on your computer. 1) No traveling outside the camp for items. The idea is to hunt within the camp. 3) Organizers are NOT responsible for your conduct, we are barely responsible for our own. All items on the list can be obtained legally (more or less), so use your head. If you get arrested or thrown out of the camp we can not help you. 4) No bribing the judges unless you bring enough for all of them. It's only fair. 5) The hunt runs from noon on aug 9th to noon on aug 11th. Any and all items must be submitted, brought performed, what have you, at the final contest on Day 4 (Saturday) @ 19:30. 6) No item may be submitted twice. 7) Fair Play above all else, this is a game and we are here to have fun. You can upset the other teams apple cart in the name of good clean fun, but remember your sportsmanship, we will disqualify for misconduct. 8) Hacker Foundation, and anyone else actually, are allowed to publish your items, your submitted photos, and other documentation of the event on the website and elsewhere for promotional and archival purposes. 9) Most of these "items" can be interpreted subjectively. Points can be added and deducted for creative and interesting interpretations. 1) All items on the list can be obtained legally, it may take some social engineering, or BENDING the rules a bit, but it can be done. 2) Look over the entire list, some things are worth a lot more points than others. You don't need to get all the items, you just need the most points. Choose wisely. 3) You have three days to complete the hunt. Take the time to plan, if an item is taking too much time, move on to something else, thats why we have so many on the list. 5) Don't forget to have fun, and see the camp!!!!!! 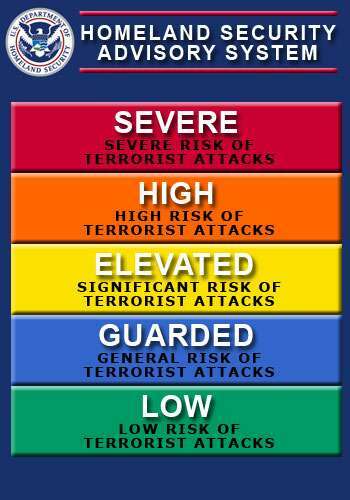 So you have an idea of how much time to spend on a given item, we've followed our fearless leader's lead and used the Homeland Security threat level system to tell you how afraid ought to be. _____ [guarded]	best website evar!!! _____ [guarded]	european to american power converter! _____ [guarded]	gather something from each village without them knowing! _____ [guarded]	how many hackers doses it take to screw in a light-bulb? _____ [elevated]	What do you mean Lenin doesn't have a myspace page, how square! _____ [elevated]	sing the theme of "Heidi"
_____ [elevated]	something that says "made in canada"
_____ [severe]	get a photo with nick and one of your teammates with no pants! This page was last modified 22:24, 9 August 2007.